At Hartland Park Animal Hospital in Lexington KY, we hear a lot of questions about pet dentist services. The basic concept of pet dental care is that pets need to visit the dentist just like humans. To help you better understand the specifics of when and why a pet should visit the dentist, we have compiled a list of the most frequently asked questions about pet dental care in Lexington. Start here and then contact us if you have additional questions concerning your pet's dental needs. Why Do I Need to Get My Pet’s Teeth Cleaned at a Pet Dentist? A pet’s teeth get tartar and plaque buildup just like human teeth. In fact, this build up is more of an issue because pets typically do not get their teeth brushed two times a day followed by flossing and a fluoride rinse. When a pet has plaque buildup it leads to decay and infection, which if left untreated can be deadly to an animal’s general health. It can also prevent the pet from eating and drinking due to pain and irritation. 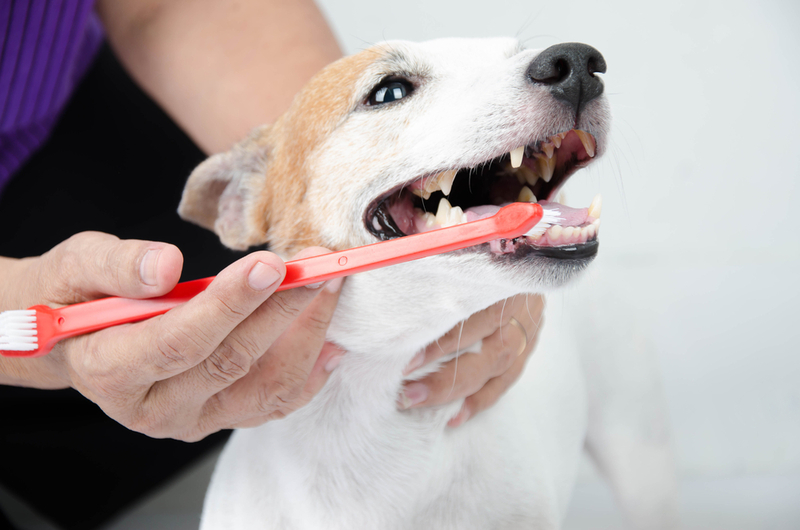 How Often Should My Pet Get Pet Teeth Cleanings? To help you keep track of pet teeth cleanings we recommend thatyou get your pet’s teeth cleaned during their annual wellness exam. This is theideal way to include pet dental care in Lexington KY as part of the health andwellness check for your pet. However, if your pet is experiencing bad breath,broken teeth, inflamed gum tissue, or refusing to eat because of pain, then youshould bring your pet to the vet for a dental check as soon as possible. Will My Pet be Given General Anesthesia during a Dental Exam? We can give your pet sedation or general anesthesia when theycome for a dental checkup or pet teeth cleaning. In fact, we recommend this formost pets simply to make the experience safer and more comfortable for them.For deep cleaning, scaling, or dental surgery, general anesthesia is mostlikely required. How can I Improve the Dental Health of My Pet? The most important move you can make as a pet owner is to bringyour pet in for a dental cleaning at least once a year. This allows our vet inLexington the chance to provide preventative care for your pet’s teeth andgums. You can also brush your pet’s teeth on a regular basis to reduce tartarbuildup. Try to brush your pet’s teeth most days of the week. While they mayresist at first, over time they will become accustomed to the practice. Our veterinarian in Lexington KY Dr. Lee Cundiff is also a pet dentist. Dr. Cundiff offers pet dental cleanings, dental checkups, gum disease treatment, and pet surgery here at Hartland Park Animal Hospital. To schedule a pet dental cleaning with our Lexington veterinarian, contact our office at (859) 245-7387.